Helping organisations make their strategies stick. Making Your Strategy Stick is a consulting engagement where we help you craft and embed your strategy story so that everyone’s on the same page – in other words, everyone understands why the change in question is happening. It could be your corporate strategy, your change strategy for a transformation program, your merger strategy or even one of your business line strategies, anything that involves major change, really. To learn more, email us today. a process to regularly share stories on how to do it right (success stories). All three parts are needed to succeed. The strategy story sets the direction and inspires action. 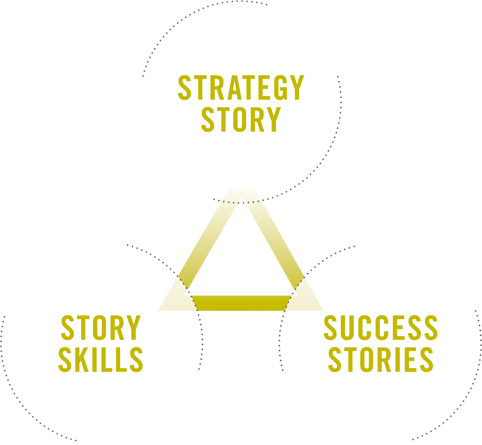 Story skills provides the communication capability that helps leaders explain what is happen and why it matters. The Success stories are the fuel to keep the system going. Each new success provides evidence of progress and a jolt of motivation. We strongly believe that it’s the job of the leadership team who owns the strategy to craft the strategy story. If it’s a corporate strategy, then the CEO must be the sponsor and be actively involved. But you don’t have to stop at the leadership team. 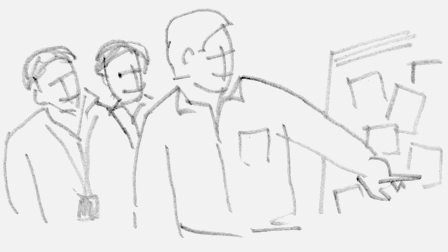 We once worked with a top-100 team to craft the core elements of a strategy story. Involving more people just means that more people have ownership of the story. When the core elements have been collected, Anecdote then skilfully crafts and polishes the story in preparation for teaching leaders how to tell it. How does story help strategies stick? Employees can only act strategically if they really know the company’s strategy. They need to have it in their heads. Stories are more memorable than facts alone, so we can get them into our heads. In fact, they’re at least seven times more memorable than facts. And stories can be read twice as fast as non-stories. Amazing really. People are also more likely to share a story than a set of dot points. Stories spread – without the need for a PowerPoint deck. One more thing about stories – you can tell the long version or the short version, depending on the setting. They’re flexible. These are just some of the reasons why a story helps your strategy stick. You should factor in about three months to do the groundwork, craft the story, build your story skills and capability, and embed the strategy story and the supporting stories that reinforce it. The time and effort you expend will be well worth it. After all, you’ll have spent good money creating your strategy. It would be a shame to waste those resources by having the strategy understood by only a few people – or even worse, misunderstood by many. You’ll have an energised workforce who will know why a strategic choice has been made, and who can share specific examples of how the strategy is coming to life in their part of the business. In the words of the futurist Alvin Toffler: ’You’ve got to think about big things while you’re doing small things, so that all the small things go in the right direction’. When we decided to embark on defining our enduring purpose, surfacing our values and determining our next set of strategies, we knew we wanted to adopt a different approach to what we had done in the past. Previously we had hosted strategic planning sessions with the Board and senior management that had resulted in strategic plans but they hadn’t necessarily captured people’s hearts and minds. When we decided to engage Anecdote to work with us using storytelling we hoped this approach would bring us better results. What we didn’t realise was that the storytelling processes would not only deliver a better strategic story but it ignited the passion of staff across the State Library to participate in ways they had only dreamt of. One of the areas I have been working on, with the team at Mars New Zealand, is to develop our capability in being more inspirational in our communication to our associates. About a year ago, I had been looking around for a company to help me with this journey when I had the opportunity to be a mentor on a GM development programme at Mars, and it was on this programme I first had the pleasure of meeting Shawn, where I had a taster of his storytelling training. I knew then and there that this was what I had been looking for, and arranged for Shawn to train my team and our wider leadership team. It is amazing the difference it has made, turning communication into inspiration. The power of story telling for leaders to get their message across is gaining increasing currency across NAB. Early this year, I asked Shawn Callahan from Anecdote to take my leadership through his workshop, which was both enjoyable and compelling in reinforcing to us why we simply must learn the art of story-telling as part of our aim to improve our personal leadership effectiveness and engagement. In May, I organised an off-site for around 40 of my senior leaders, and we used story telling in two ways. Firstly, I asked each of my direct reports to tell a story of a work achievement that they had been most proud of, and the impact that had. Then to round out the day, I broke the group up into their state teams and asked them to come up with their best story that reflected when they had best and most proudly demonstrated one of NAB’s five core values. One person from each state then had to present back to the group, with a prize for the best story. • Our team left the conference confident of the difference we are making to the business, and highly engaged. Whilst it would be unfair to attribute our staff engagement result entirely to this, I am sure there was an impact in moving our score from 36% to 63% this year. A result we are all very proud of. Find out more about our story-driven approach to change.